Buttery, moist, soft Almond Cherry Muffins. Full of flavour & bursting with juicy cherries in every bite. And they can be made gluten-free! Almond Cherry Muffins. As soon as cherry season starts, that’s it, I’m hooked. It’s so short and we are without them for so long, that when they are here I just have to eat them like a cherry crazed fiend. I mean like cherry EVERYTHING. I might just have eaten my Black Forest Overnight Oats for breakfast every day for the past week. I love them that much! I didn’t go all out and add the whippy coconut cream though. I do have some restraint. Every day might have been a bit much for that. 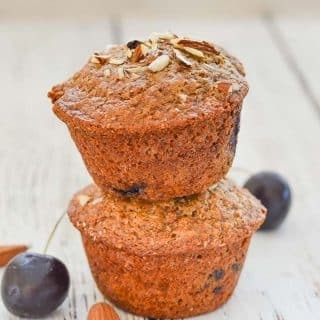 Then in between breakfast and snacking on handfuls of cherries, I have been eating testing these Almond Cherry Muffins since the minute cherry season arrived. They took a little while to get just right and I have now reached the stage where I don’t want to see another muffin for as long as I live…. Until next week…. I’ll have forgotten about them by then and will be ready to eat muffins all over again….???? So, these Almond Cherry Muffins. They are buttery, soft, fluffy, not too sweet and studded with b-eautiful chopped fresh cherries.???? They are buttery thanks to the ground almonds. Just like in my Easy Vegan Butter recipe, the almonds are there for that very reason. And of course in these muffins because they go so well with cherries. Almonds and cherries are like the perfect marriage. Absolutely made for each other. OIL-FREE & A GLUTEN-FREE OPTION! Despite being buttery these muffins are completely oil-free. The only fat in this recipe is that which is naturally occurring in the almonds. There is no added oil at all. And for the gluten-free crew out there (because I know there are a lot of you), there is a gluten-free option. 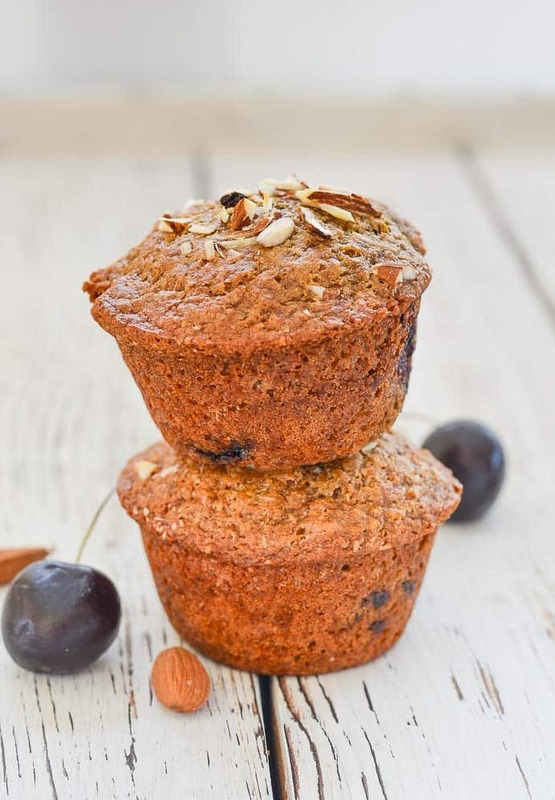 Yes Gluten-Free Almond Cherry Muffins! You can use regular all purpose flour or you can use oat flour. Both give great results. (The muffins in my photographs are made with oat flour). The quantity of flour varies slightly for each so make sure you check that carefully before you get going. 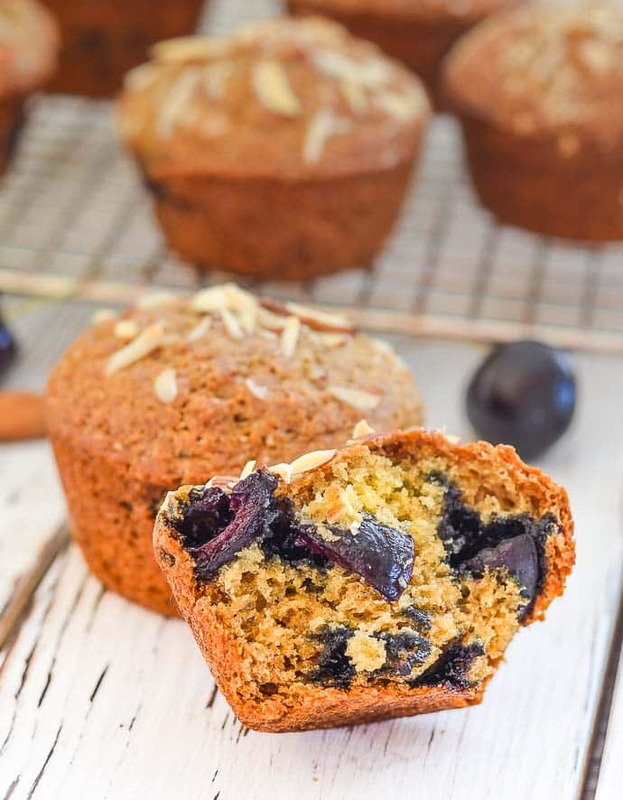 The almond flour is pretty necessary in this recipe to get the very best flavour but you could sub it for some extra oat or all purpose flour if you needed to because of nut allergies. I like to use natural almond extract but if you have a nut allergy to consider, I believe that some imitation almond extract is nut-free. Always check the packaging or with the manufacturer first though just in case. I love to top my Almond Cherry Muffins with some some shards of raw almond. It makes them look pretty but the main reason is for texture. It’s so nice to have a bit of crunch going on when you are eating the slightly crusty muffin tops. I used a sharp knife and whole almonds to make my shards because I have somehow ended up with a trillion million almonds in my pantry but almonds slivers/flakes from the store will look a little neater. Mine are what you call rustic! 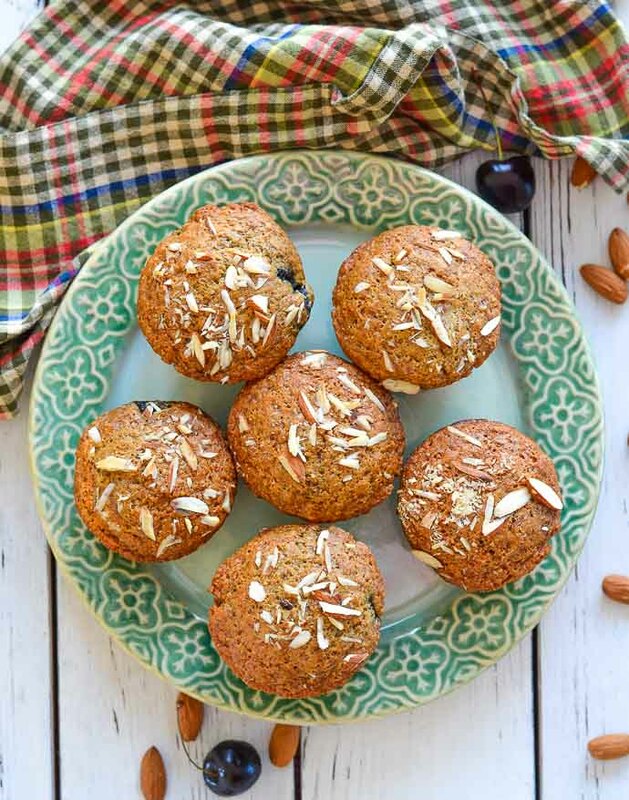 I can’t wait to hear what you think about my Almond Cherry Muffins. Hit me up on Instagram or in the comments below to let me know. Use the hashtag #avirtualvegan if you share any pics. I’d love to see! 135g / 1 cup all purpose flour , spooned into the cup then levelled off with the back of a knife. Don't scoop as the weight will be significantly different. 2 teaspoons baking powder , be sure to use an aluminum free variety to avoid having your muffins turn a lovely shade of blue! Preheat oven to 425°F and prepare a muffin tin. Either grease it or line with liners. Add the flour (either all purpose OR oat flour), almond flour, sugar, baking soda, baking powder and salt to a bowl. Stir together well. Add the almond extract, vinegar, apple sauce and milk (use milk ONLY if using all purpose flour), to another small bowl or jug and mix thoroughly. Pour the wet ingredients into the dry ingredients and stir gently until it is just combined. Do not beat it together. You just want to make sure no dry flour is visible. Spoon evenly into the prepared muffin tins so they are about ¾ full. You should get about 6, possibly 1 or 2 more depending on the size of your tin. Sprinkle the tops with the flaked/slivered almonds and get into the oven as quickly as you can. After 5 minutes in the oven turn the temperature down to 375°F (don't open the door) and cook for another 12 - 15 minutes. A tooth pick inserted into one of them should come out clean after that time. If it doesn't give them a minute or two more. Once cooked remove from tin and leave to cool in a cooling rack. To make almond flour, just blend almonds in a blender or food processor until they are a fine flour. Be sure to stop as soon as they are flour otherwise they will turn into almond butter. For this recipe it is fine to leave the skins on the almonds. To make oat flour simply blend rolled or quick oats in a blender or food processor until they are a fine flour. If fresh cherries are not available dried cherries will work as will frozen cherries. Chop them and add tot he batter while still frozen. I haven't tried it but I think blueberries would work well instead of the cherries too. I specify to use aluminum free baking powder because the aluminum can react with the fruit and turn everything a strange blue colour. If your baking powder is aluminum free this wont happen.